Add soy and brown sugar to a small sauce pan – Simmer gently (really – VERY gently – This can easily boil over, and believe me, you will have a mess on your hands), stirring, until the sauce is reduced to your liking. You can easily make more or less, just start with the ratio of 1:1. Some folks like theirs less sweet, and if you fall into this category, decrease the sugar or increase the amount of soy. A quick note on consistency: I like my teriyaki thick, but if you reduce it too much, it will become unmanageable when cool. Reduce to just BEFORE the desired consistency. If desired, add garlic when reducing, or ginger when cooling. Use on chicken, fish, or beef headed for the grill- You can marinate with this sauce, but I suggest doing it for no longer than 15 minutes prior to cooking. Brush on sauce a time or two during cooking. 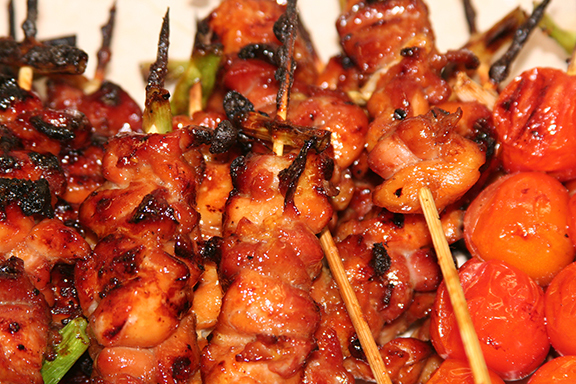 If you wish to use as a dipping sauce, reserve some before you grill with it to avoid cross-contamination.